Chicken Inn drew 1-1 against ten-man Ngezi Platinum at Luveve Stadium on Saturday afternoon. The match was delayed by twenty minutes as the visitors were refusing to get on the field protesting that they can’t play with Major Musasa being the assistant referee. Musasa is the son of Joseph, an official at fellow title contenders, FC Platinum. Ngezi later gave in, and the play started. The first goal of the match came on the 41st minute through Keith Murera who gave Madamburo a lead before the break. The Gamecocks regrouped in the second half, and captain Moses Jackson found the equaliser after six minutes of play. They continued to control possession with George Majika causing all sorts of troubles to the Ngezi backline. Clive Augusto received his second bookable offence in the 66th minute. With one man short, Ngezi held on and squeezed a draw as they went four points behind log leaders FC Platinum. At Ascot Stadium, Tinashe Makanda’s debut for Highlanders was marred by an injury in a goalless draw against Nichrut. The striker picked up a knock in the 21st minute and had to be replaced by Brian Banda. Tafadzwa Sibanda also made his first appearance for Bosso, coming in as a second-half substitute. The match had few highlights in the first period as both teams made no meaningful threats. However, the home side got a penalty on the stroke of half-time after McClive Phiri fouled Rodrick Mutuma. Themba Ndlovu stepped up to take the kick but was denied by Ariel Sibanda. Nichrut survived a scare after the hour mark when keeper Stanley Chikwana saved a dangerous Nigel Makumbe long-range strike. The match ended with no goals scored and Highlanders remain fifth on the log. At Mandava Stadium, FC Platinum beat Chapungu FC 2-0 to extend the gap on top. 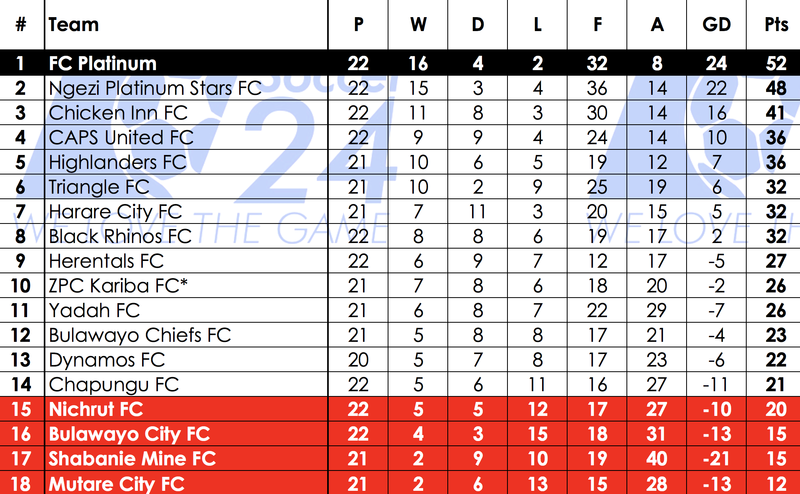 Pure Platinum Play are now on 52 points, thanks to Gift Mbweti and Winston Mhango’s second-half efforts. The game had a lively start and Chapungu could have grabbed the lead in the 19th minute, but Wallace Magalene pulled a brilliant save against Kelvin Nyoni in a one-on-one situation. Mbweti who came in as sub broke the deadlock with a beautiful left footer on the hour before Mhango sealed the victory thirteen minutes later. 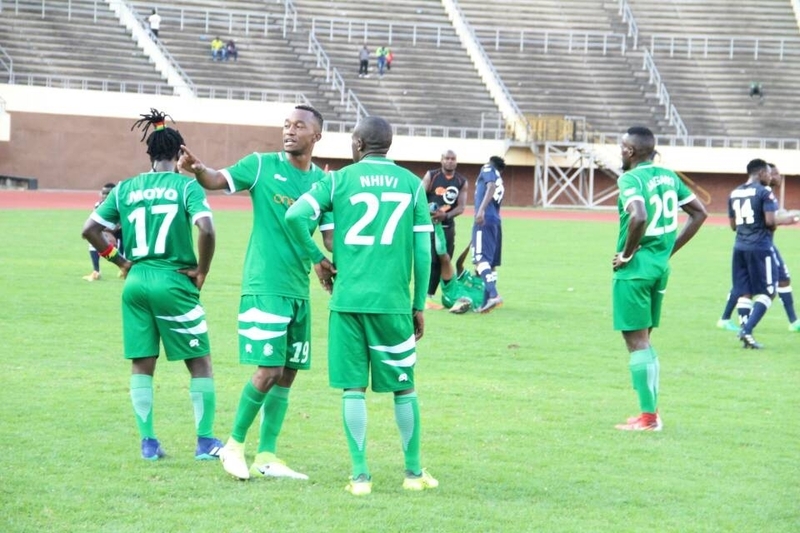 In Harare, there was also a twenty-minute delay in the game between Herentals and CAPS United. The hosts frustrated Makepepeke by denying them entry into the stadium before the game started. The visitors were only allowed to get in thirty minutes before kick-off. Nonetheless, both teams failed to deliver in a dull encounter, and it ended goallessly. Across the capital, Black Rhinos beat struggling Bulawayo City 2-0 at National Sports Stadium. Wellington Taderera (34′) and Lot Chiunga (85′) were on target for the army side.